​Below is a simulation of TrotBot's linkage with the heel and retractable toes added, using non-LEGO dimensions. 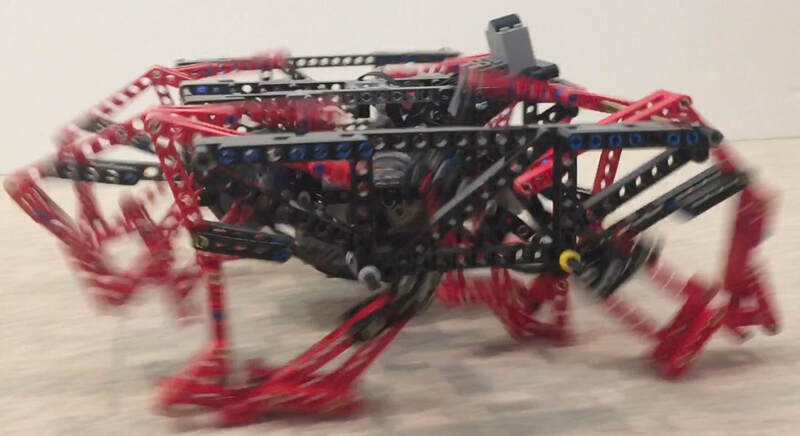 As can be seen in the videos of LEGO prototypes at the bottom of this page, the heel/toe linkages in LEGO are an approximation, resulting in a gait that isn't as smooth as what is simulated here - which is more noticeable at higher speeds on harder ground. 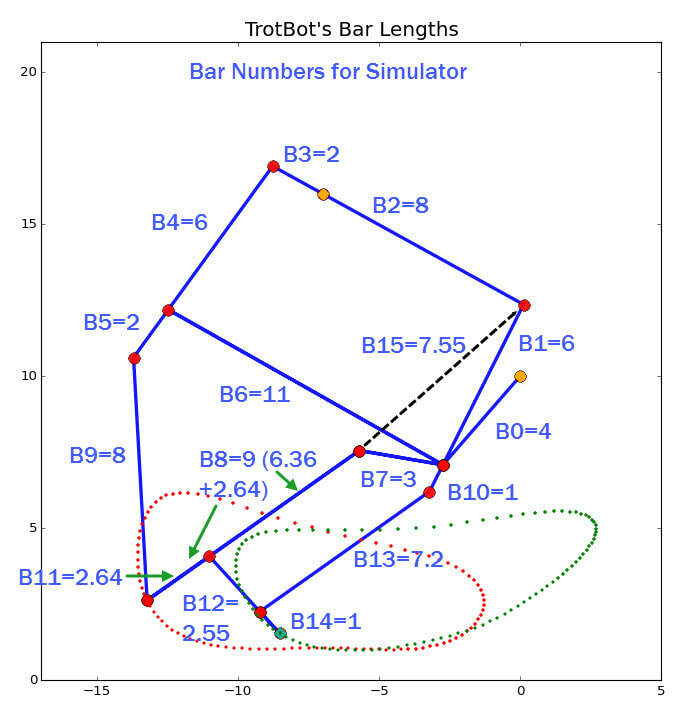 The diagrams below can get crowded and confusing, so the linkage is presented in two stages, starting with TrotBot's bar lengths without the retractable toe. Please note that the triangle's bottom right angle highlighted in pink is not 90 degrees, but is 109.475 degrees. 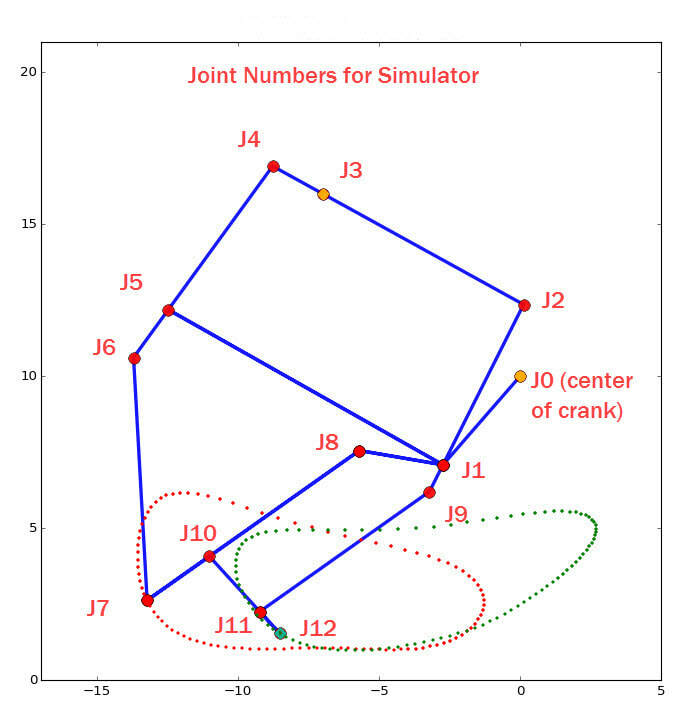 In case the 109.475 degree angle of the triangle above is confusing, below is the same linkage using a 90 degree angle instead, while shortening bar B7 from 3 to 2.83 and connecting it one unit below the crank to bar B10. TrotBot's without heels and toes work well at LEGO-scale if built in a 12-leg version, but it's a wide build and the weak plastic LEGO axles can twist a lot and cause a jerky gait. 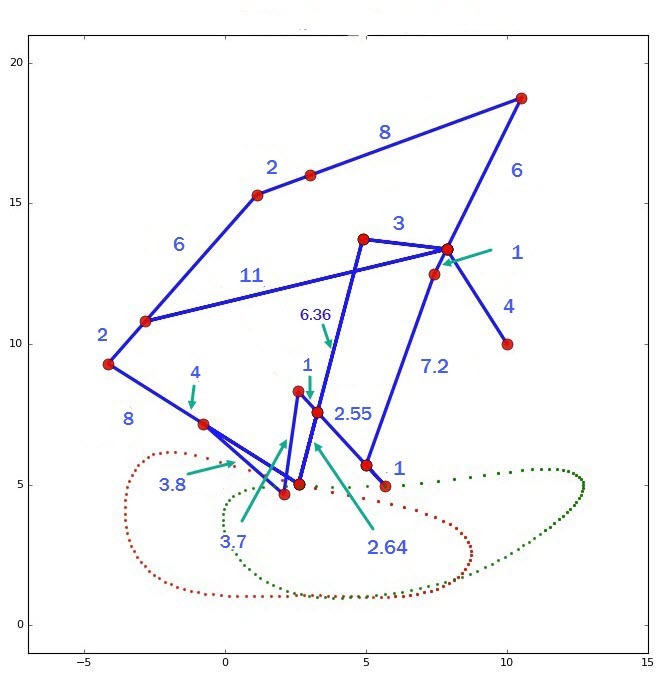 If the heel and toe linkages are added, fewer legs are needed. Below are some examples of TrotBot's heel and toe evolution in LEGO prototypes, which we originally developed to get a decent walk out of our giant wooden TrotBot Ver 0 that had only 8 legs and could barely walk without them. 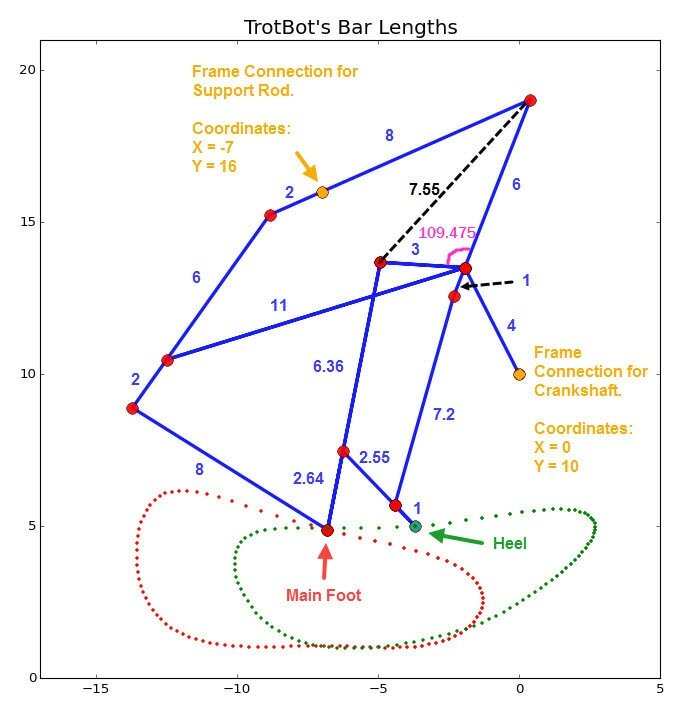 First, we added TrotBot's heel linkage, which takes TrotBot's weight while the main foot is still descending, and pushes backward to maintain TrotBot's speed while bearing the weight. The heel also allows the rear legs to clear higher obstacles so that TrotBot doesn't get stuck astride obstacles, and it has better climbing leverage than the main foot does on extreme terrain, like when climbing stairs of 2x4s. 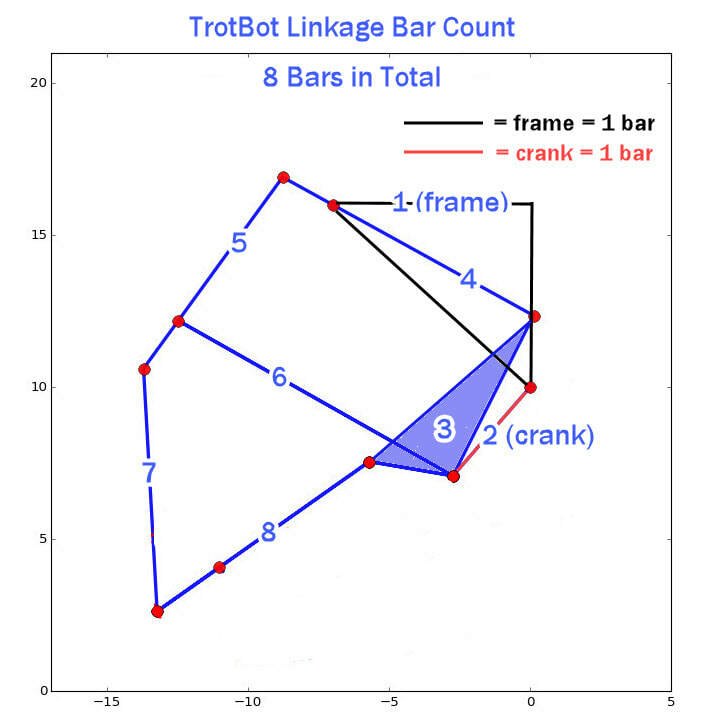 ​Below is a video of an 8-legged TrotBot with the heel linkage added, but not the toe linkage. Lacking toes, it has a gait that is too bumpy for the Mindstorms' Brick - bouncing the heavy EV3 Brick up and down requires too much torque - but toeless TrotBots work well with the lighter Power Functions' battery box and motors, as is used in the TrotBot in the video below. ​The yellow TrotBot above used LEGO's faster but lower power medium motors geared down by 5:1. The red TrotBot Ver 3 below used LEGO's XL motors, which helped TrotBot to grind its way over the couch while in a faster gear ratio of 5:3. NOTE: when using the XL motors you may want to switch the inner legs' plastic axles to steel axles to handle the higher torque. ​Next, we added toes to increase the foot-contact with the ground on the inner side of TrotBot's foot-path. Early on, we built some TrotBots with fixed angle toes like Strider Ver 3 uses, which improved walking performance on flat ground. 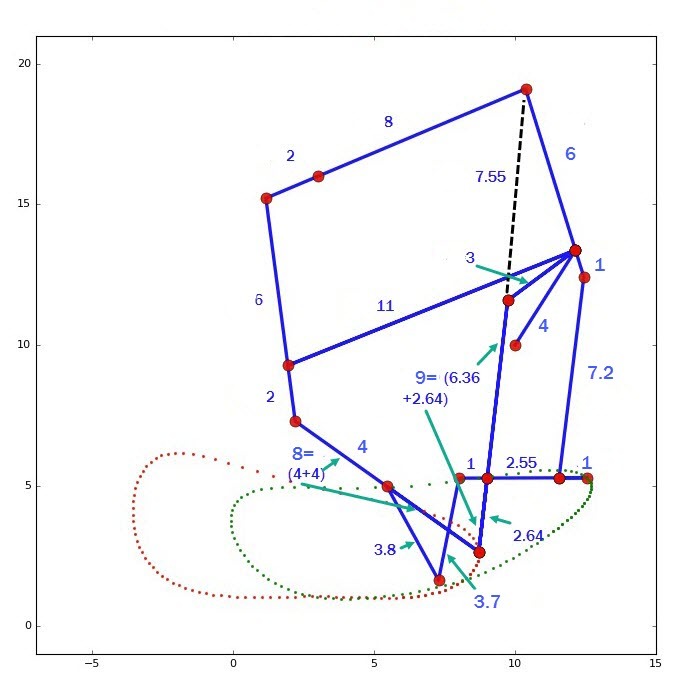 However, unlike Strider's symmetrical, boat-shaped foot-path, TrotBot's is somewhat tear-dropped shaped, and since the toes are lifted off the ground on the shorter side of the foot-path, they tended to get caught on obstacles, jamming the linkage. 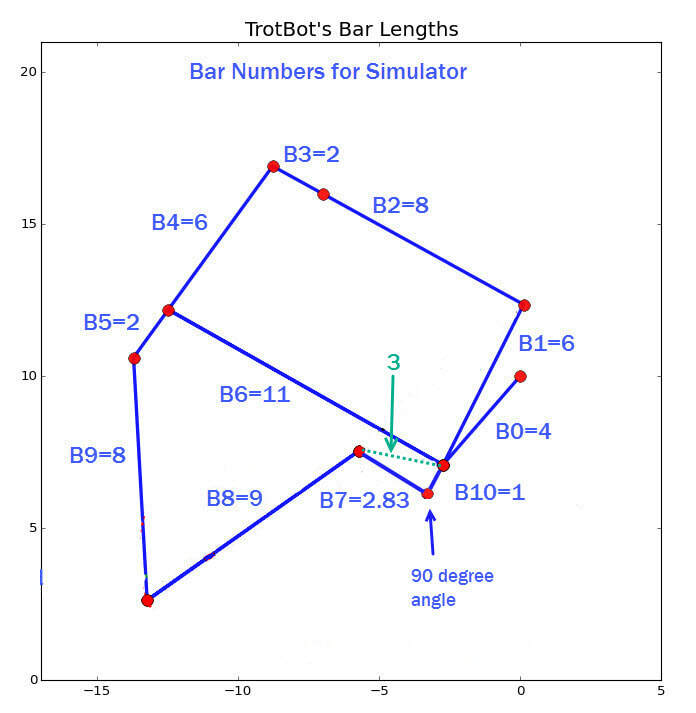 You can see an example of these fixed-angle toes on a Mindstorms TrotBot in the beginning of Walkers in the Desert. ​To avoid toe-jamming, we tinkered to create a toe that would paw backward, and then remain folded back as the leg was lifted, similar to how horses paw their hooves backward and then keep them folded back as they lift and pull their legs forward. Note: we only walked TrotBot across these big rocks twice, once to see if it could make it across, and once more to film it, and even that left many scratches on the LEGO parts (unlike when climbing on softer materials, like wooden 2x4s - or the couch). Also, the above video starts out with TrotBot geared up to a 1:1 ratio, which was made possible by adding toes to smooth the gait, BUT the motors quickly stalled, so TrotBots with XL motors should only be geared up to 5:3.